Recently renovated to include modern accessories like WiFi, the two-bedroom vacation apartments Art Rebus Tower in Radda in Chianti offers adults an opportunity for a truly unique vacation venue. Set on three floors, this stone tower holiday rental, features a fabulous terrace where you can enjoy panoramic views of the stunning Chianti Classico landscape. Tucked in the hillsides of Tuscany, between Florence with its world-renowned museums and Siena with its enchanting atmosphere, Art Rebus Tower give you easy access to wine tasting, World Heritage landscapes and many quiet small towns. The owner has recently renovated the Art Rebus Tower to provide modern accessories and comfort for her guests. The historic tower, in the center of Radda in Chianti, is located in a prominent and active small town nestled between the cities of Florence and Siena, surrounded by Chianti Classico vineyards. If you are looking for a break from the city life and to immerse yourself in a unique venue full of art, silence and stunning views from the top balcony, this tower promises to be your ideal holiday home. 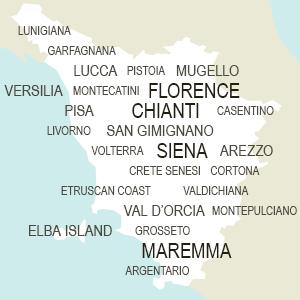 It's located between Florence and Siena. The tower is good for couples, business/ sports travelers, families, groups, writers or artists. The holiday rental is comprised of three floors and will accommodate up to 6 persons. There are 2 double bedrooms with a typical Tuscan decor. The apartment is furnished with all bed, bathroom and kitchen linens. Art Rebus Tower also features two living room areas, one of which is furnished with 2 single beds. There is free WiFi throughout the tower for checking emails or navigating the internet. The kitchen is compact yet includes everything you need for an easy meal: a full refrigerator, an oven and a stove with 4 burners. There are ample tableware and cookware so you can experiment with the local flavors or prepare a plate of typical appetizers for a sunset viewing on the private terrace. The nature of the accommodations, set on three floors makes it suitable for adult guests only. One of the bedrooms at Art Rebus Tower boasts an en-suite bathroom and the second new decorated bathroom is available for the other guests. Extra special is the private balcony on the first floor. All the windows are new and provide extra protection and silence. The historic residence also includes a SAT TV. Since this is a tower from the 1200’s, all floors are accessible only by stairs. Besides making time to visit the many museums in Florence, the colorful churches, and Duomo and tasting the awesome Bistecca Fiorentina, the position also allows for easy day trips to Siena where you can wander the cobbled stone vias, shop the boutiques and visit the Piazza Grande where il Palio takes place. Radda in Chianti and Art Rebus Tower are also in a convenient position for discovering the Creti Senesi to the south, Arezzo and Cortona to the west, Monteriggioni and more to the east - so there will never be a shortage of places close by to plan a personal adventure.